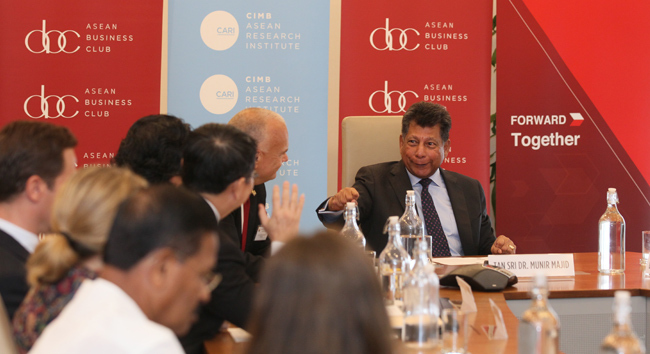 ASEAN Roundtable Series on How does ASEAN navigate the new trade [dis]order? 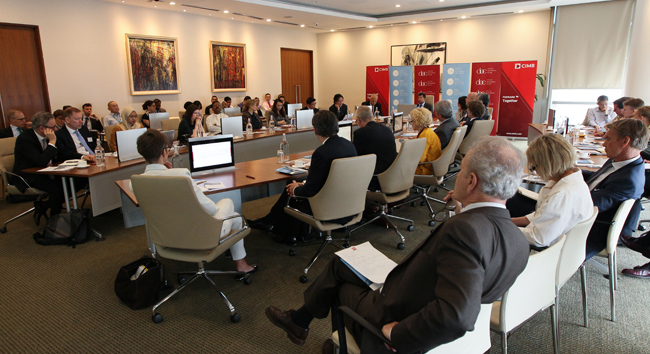 Home / ASEAN Roundtable Series / ASEAN Roundtable Series on How does ASEAN navigate the new trade [dis]order? 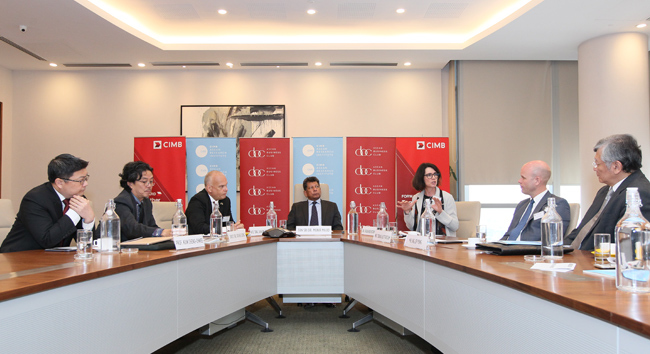 CIMB ASEAN Research Institute in collaboration with the Embassy of Sweden and ASEAN Business Club held a roundtable discussion on 1st April 2019, with the theme How does ASEAN navigate the new trade [dis]order?. Speakers included Prof. Dr. Kuik Cheng-Chwee, Associate Professor of the Institute of Malaysian and International Studies (IKMAS), Universiti Kebangsaan Malaysia; Dr. Cecilia Ruthstrom-Ruin, Deputy Director-General, Head of Department for Asia and Oceania, Ministry of Foreign Affairs, Sweden; Dato’ Dr. Ooi Kee Beng, Executive Director of Penang Institute; Tan Sri Dr. Munir Majid, Chairman of CIMB ASEAN Research Institute (CARI) and President of the ASEAN Business Club; Tobias Glitterstam, Senior Vice President and Head of Asia and Oceania of Business Sweden; Ng Lip Yong, Honorary Advisor of Malaysia-China Chamber of Commerce; and H.E. 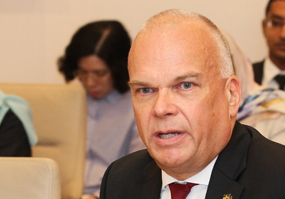 Ambassador Dag Juhlin-Dannfelt, Ambassador of Sweden in Malaysia. Discussion summary will be released soon. Dag Juhlin-Dannfelt has a background in law and began his career as a Junior Judge at the County Court of Strömstad, Sweden. He joined the foreign service in 1990, working with European affairs until 1994. From 1994 to 2005, he worked at the Swedish Embassies in Teheran, Tel Aviv and Islamabad (covering Pakistan and Afghanistan). 2005-2011 he worked at the Ministry for Foreign Affairs in Stockholm, holding the positions of Coordinator for Development Cooperation and Human Rights for Middle East (2005-2006), Head of the Gulf Section (2006-2008) and then Deputy Head of the Middle East and North Africa Department (2008-2011). 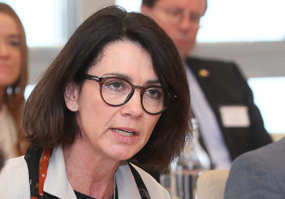 From September 2011 to August 2016, Juhlin-Dannfelt was Ambassador of Sweden to the Kingdom of Saudi Arabia, and Non-resident Ambassador to the Sultanate of Oman, State of Kuwait and Republic of Yemen. Since 1 September 2016, Juhlin-Dannfelt is Ambassador of Sweden to Malaysia, having presented Letter of Credence on 2 December 2016. Dr. Kuik Cheng-Chwee is an associate professor at the Institute of Malaysian and International Studies (IKMAS), the National University of Malaysia (UKM). He is concurrently a nonresident fellow at the Foreign Policy Institute, Johns Hopkins SAIS, Washington, DC. He is co-founder of the East Asian International Relations (EAIR) Caucus, a research platform for exchange, engagement, and empowerment among foreign affairs professionals in Malaysia. 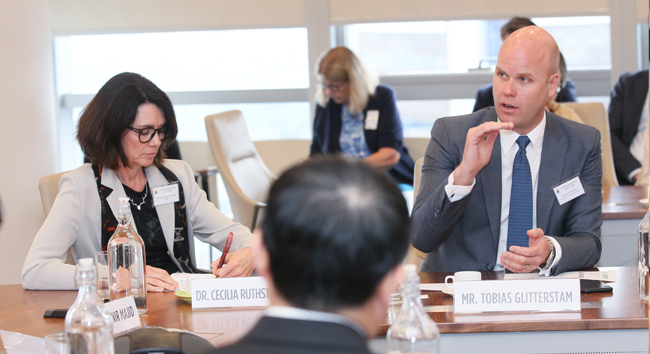 Previously he was a postdoctoral research associate at the Princeton-Harvard “China and the World” Program (CWP) and a visiting research fellow at Oxford’s Department of Politics and International Relations. Dr. Kuik’s research concentrates on weaker states’ foreign policy behavior, state alignment choices, regional multilateralism, East Asian security, China-ASEAN relations, and Malaysia’s external policy. 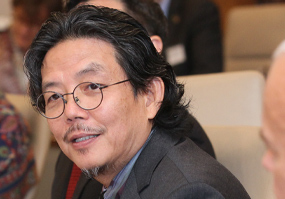 His publications have appeared in peer-reviewed journals such as Journal of Contemporary China, Contemporary Southeast Asia, Chinese Journal of International Politics, Asian Security, China: An International Journal, Asian Politics and Policy, East Asian Policy, Shijie Jingji yu Zhengzhi, as well as edited books. Dr. Kuik’s essay, “The Essence of Hedging” was awarded the biennial 2009 Michael Leifer Memorial Prize by the Institute of Southeast Asian Studies for the best article published in any of the three ISEAS journals. He is a co-editor (with Alice Ba and Sueo Sudo) of Institutionalizing East Asia: Mapping and Reconfiguring Regional Cooperation (Routledge 2016). 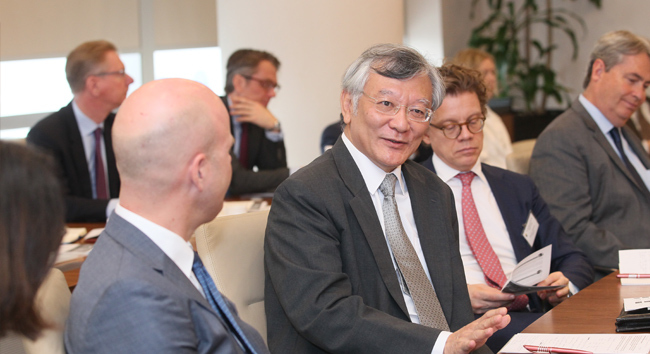 Dr. Kuik is a regular invited speaker to international conferences and closed-door policy roundtables. His current projects include: hedging in international relations, ASEAN states’ responses to China’s Belt and Road Initiative (with Lee Jones), and politics of China-related railroad projects in Southeast Asia (with David Lampton and Selina Ho). Cheng-Chwee serves on the editorial boards of Contemporary Southeast Asia, Australian Journal of International Affairs, and Routledge’s “IR Theory and Practice in Asia” Book Series. He holds an M.Litt. from the University of St. Andrews, and a PhD from the Johns Hopkins University’s School of Advanced International Studies. Dr. Ooi Kee Beng is the Executive Director of Penang Institute. He was the Deputy Director (2011-2017) of Singapore’s ISEAS – Yusof Ishak Institute, where he had been a fellow since 2004. Born in Penang, Malaysia, he received his PhD in Sinology from Stockholm University. He is also a Förvaltningsocionom, graduated from Socialhögskolan i Stockholm. He represented Sweden in the first World Wushu Championships in 1991 held in Beijing, and in the European Wushu Championships in 1992 (where he was runner-up in Taijiquan) and 1993. His published translations of Chinese war strategy such as Sunzi’s Art of War, Wuzi’s Art of War and Weiliaozi’s Art of War are the first from classical Chinese to Swedish. His many books include The Eurasian Core and Its Edges: Dialogues with Wang Gungwu on the History of the World. His book, The Reluctant Politician: Tun Dr Ismail and His Time, won the “Award of Excellence for Best Writing Published in Book Form on Any Aspect of Asia (Non-Fiction)”. His latest book is Catharsis: A Second Chance for Democracy in Malaysia. His personal website is: wikibeng.com. Tobias Glitterstam is the Vice President and Regional Manager of Asia Pacific at Business Sweden. Being based in Shanghai, he is leading the organisation with 11 Trade Commissioners, 15 offices and 150 market expansion consultants in the region. Glitterstam has extensive experience of consulting multinationals and leading Asian enterprises in the area of internationalisation and business growth, formerly as a Partner of the renowned consulting firm Accenture. He has operated in Asia since 2003, with a particular focus on the Chinese market. 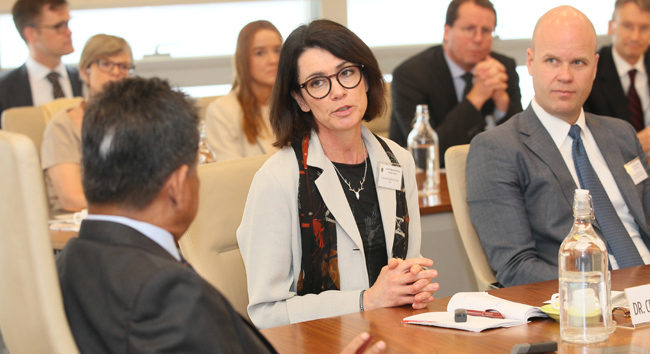 Glitterstam was appointed to VP Asia Pacific in 2016, after having first joined Business Sweden as the Trade Commissioner to China back in 2015. 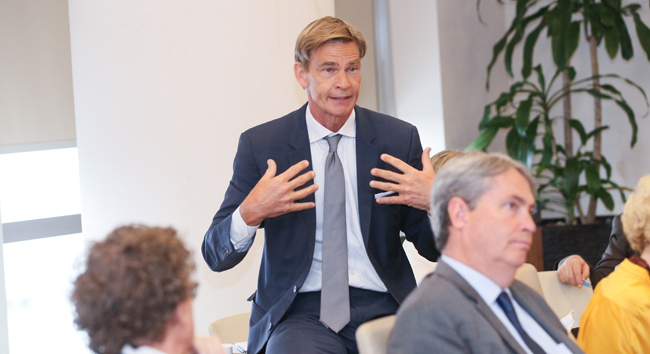 In his current capacity he is steering business promotion efforts across the region, in areas such as Smart Cities, Industry 4.0, future transportation, life science and environment, always under the theme of Sweden as a leader in Innovation and Sustainability. Furthermore Glitterstam is a senior advisor to Swedish enterprises in the area of market entry and business growth in Asia Pacific, often in the direction of exploring frontier markets, strategic innovation, expansion into new segments, market partnerships and M&A. 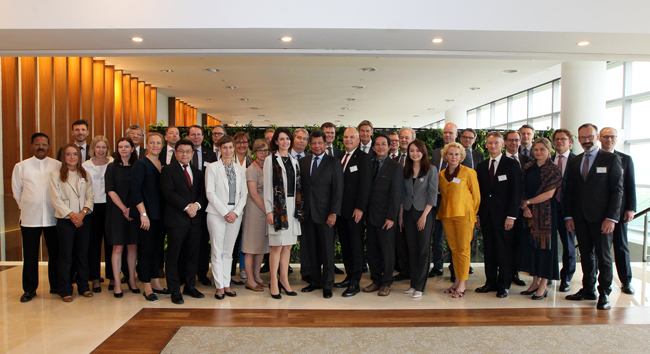 Glitterstam also oversees the Swedish Invest promotion organisation in Asia Pacific with the objective of attracting investments into Sweden. 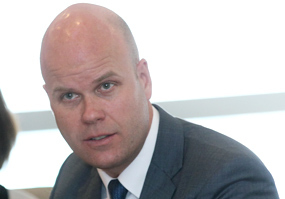 Tobias Glitterstam holds a degree in Business from Lund School of Economics and Management. He lives in China with his wife Karin and their three children. Mr Ng Lip Yong was appointed to the Board of Industrial and Commercial Bank of China (Malaysia) Berhad on 7 February 2019. He holds a Bachelor of Engineering (Hons) in Electronic Engineering from University of Sheffield and Master of Science in Microwave and Communications Engineering from University of Leeds, UK. He held various positions/advisory roles in the government agencies and corporate companies. He joined Standard Telephone & Cables Ltd in England as an engineer in 1975 and subsequently worked as an engineer with Telecommunications Authority of Singapore before returning to Malaysia to take up the position of Resident Manager of GTE International Incorporated, USA (Malaysia Representative Office). Mr Ng also was involved in several family companies in housing development, construction and oil palm plantation. He also served for a short period as Managing Director of Hai-O Marketing Sdn Bhd and Hai-O Energy Sdn Bhd as well as Business Advisor of Hiap Teck Venture Berhad. Mr Ng was elected as the Member of Parliament for Batu Constituency in 1999 to 2008. 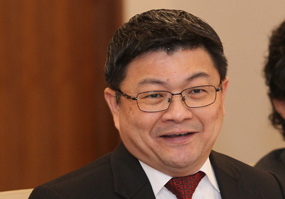 He served in the Malaysian Government as Deputy Minister of Ministry of International Trade and Industry (MITI) (2006- 2008) and Parliamentary Secretary of Ministry of Plantation Industries & Commodities (2004-2006). 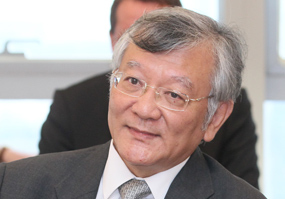 He also was the Chairman of Malaysian Logistics Council as well as Chairman of Federation of ASEAN Shippers Council. He served as Chairman/Director of Malaysian Futures Clearing Corporation and Deputy Chairman/Director of Kuala Lumpur Commodity Exchange. 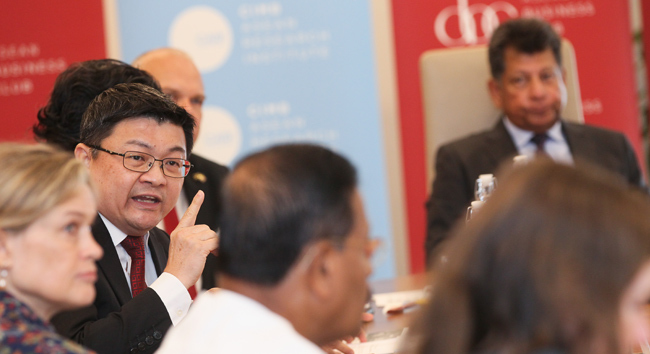 Since 2009, Mr Ng has been an Honourary Advisory of Malaysia-China Chamber of Commerce. Tan Sri Dr. Munir is currently Chairman of CIMB ASEAN Research Institute, of Bank Muamalat Malaysia Berhad, of the Financial Services Professional Board, of ASEAN Business Advisory Council, Malaysia, as well as President of the ASEAN Business Club. 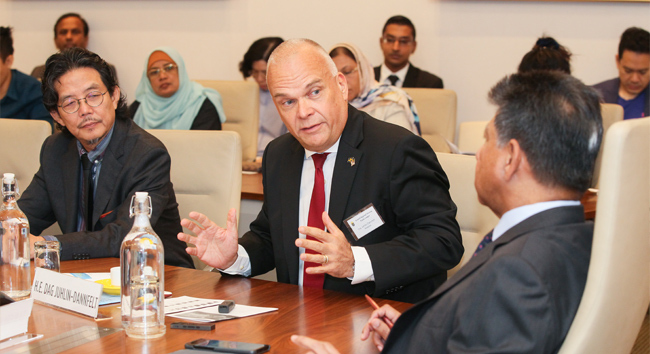 He is a member of the Economic Action Council chaired by the Prime Minister of Malaysia. He also sits on the board of the Institute of Strategic and International Studies (ISIS) Malaysia. He is an active advocate of deeper ASEAN economic integration. He has an extensive experience and is well known in the Malaysian corporate world. He had been the Group Editor of the New Straits Times, first executive chairman of CIMB and founding chairman of the Malaysian Securities Commission. 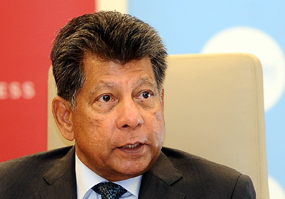 After stepping down from the Securities Commission, he became Independent Non-Executive Director of Telekom Malaysia Berhad, Chairman of Celcom (Malaysia) Berhad and Non-Executive Chairman of Malaysian Airline System Berhad. He was Founder President of the Kuala Lumpur Business Club, established in 2003 and is a member of the Court of Fellows of the Malaysian Institute of Management. Tan Sri Dr. Munir obtained a B.Sc (Econ) and Ph.D in International Relations from the London School of Economic and Political Science (LSE) in 1971 and 1978. He is an Honorary Fellow of LSE and continues the long association with his alma mater as Visiting Senior Fellow at the Centre of International Affairs, Diplomacy and Strategy. Tan Sri Dr. Munir is an associate of Southeast Asia Centre (SEAC) at LSE.